No reaching of a landmark is an easy achievement. Whether scoring 100 runs or taking 100 wickets is not -without pitfalls. The same is true with completing 100 matches. The many who’ve achieved this landmark have had to go through a lot of sweat and toil. Tamil Nadu wicket-keeper Dinesh Karthik’s completion of 100 Ranji Trophy matches is a case in point. But his 100th game was a memorable one -indeed. He scored the winning slot – a straight six – as Tamil Nadu beat fancied Karnataka at Visakhapatnam in a quarter–final Ranji game. It was in 2002 that Karthik made his debut for Tamil Nadu in the Ranji Trophy in a match against Baroda. S. Suresh was the team captain and Karthik played alongside the likes of Sridharan Sriram, J. Madana-gopal, J. Gokulakrishnan and Hemang Badani. Now, they’ve all become coaches. In fact, Madanagopal and Gokula-krishnan coached Karthik at Albert TUTI Patriots in the Tamil Nadu Premier League. Karthik came into the limelight in 2004. He played for -India Under-19 in the World Cup that was staged in Bang-ladesh. Then he scored a -fabulous 109 not out in the 2004 Ranji Trophy final at the M.A. Chidambaram Stadium. His performance was taken note of. Karthik was a 19-year old when he was selected to play for India in the ICC Champions Trophy held in England in -September 2004. A couple of months later Karthik made his debut against the Australians in the final Test at Mumbai played on spinning track. India won it narrowly. Not many will forget the sight of Karthik, horizontal on the ground, as he stumped Michael Vaughan in 2004. It was his first dismissal as a wicket-keeper for India, but is international career never -really took off. Around 2010, despite his churning out runs in domestic cricket, India had M.S. Dhoni at the helm and behind the stumps, so there was very little Karthik could do. Karthik’s best phase playing for India came in 2007 when he scored consistently against Bangladesh, England and South Africa. In England, under Rahul Dravid’s captaincy, he opened the innings and scored a couple of fifties. He continued to play for India till 2010 before he lost his place. He regained his spot for the 2014 Asia Cup that was held in Bangladesh. An unnecessary error against Sri Lanka where he failed to stump Kumara Sangakkara cost India heavily and he lost his place in the team. Karthik remembers his first hundred. He got it against Railways in 2003-04. “I had to play out the last ball of the day and we were 220 odd for 5 in a tricky situation. I stepped out and hit the last ball of the day for a six,” he said. “I just felt that I could not defend, so just stepped out and hit the ball. That was the mindset back then. 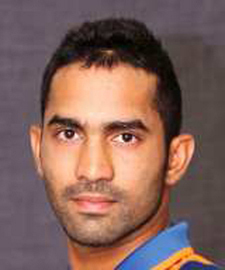 “Another hundred was against Baroda when we were trailing and we won. Even against Railways, this season, we were behind the eight-ball and I scored a hundred and we won the game.” It isn’t difficult to see why Karthik feels unchallenged. He has all the shots in the book and a few that aren’t in there as well. And that has made him a pretty handy limited-overs player. In a Champions League T20 game between Mumbai Indians and Chennai Super Kings, R. Ashwin went around the wicket, paused in his action, and then bowled a quicker one on middle and leg stump. Karthik, having shuffled outside off, paused as well and then -viciously slog-swept his Tamil Nadu team-mate into the stands beyond square leg. Once, against Sunrisers Hyde-ra-bad, Karthik reverse-paddled -medium-pacer Darren Sammy for four off the back of the bat for Delhi Daredevils in Dubai. All that flash has also got him into trouble. In Tamil Nadu’s first game of last Deccan’s Ranji Trophy, Karthik attempted an ambitious scoop and perished in a tense low-scorer. Mumbai won. Several coaches have tried to wean him off the high-risk-low-reward shots, but those have also contributed to some of his more memorable performances too. Karthik is now the senior-most player in the State side. While he was disappointed that a finger injury coincided with India’s hunt for a wicket-keeper to stand in for Wrid-dhiman Saha in the Test series against England, he has learnt to accept such setbacks are -inevitable. He has learnt to move on. In 23 Tests for India, Karthik has scored 1,000 runs and in 71 One-Day Internationals he has scored 1,313 runs. He has pouched 51 catches in the Tests and effected five stumpings and in ODIs held 49 catches and stumped seven. He has played only in 31 Twenty/20 matches for India. In 152 first class matches, Karthik has scored 8,878 runs, 5,006 runs in 186 List A matches thus far and 3,682 runs in 199 Twenty/20 games. In all he’s held 366 catches in first class games and stumped 40 victims. In List A games, he’s held 165 catches, stumped 37 victims. In T/20 games, he’s held 121 catches and stumped 44.